You will not find tableware like this at even your poshest holiday feasts. Prepare to be dazzled at the Frick Collection’s exhibition Luigi Valadier: Splendour in 18th-century Rome (until 20 January 2019), the first monographic exhibition on this master of decorative arts. The clientele of the designer, gold- and silversmith, draughtsman and bronze founder, included popes, royalty and aristocracy across Europe. Whimsy is rarely found in the heavy sumptuousness of an object in marble, gilt bronze, enamel, lapis lazuli and other precious materials, but the exhibition’s pièce de résistance—a deser made for Jacques-Laure Le Tonnelier, Bailli de Breteuil—pulls this off. 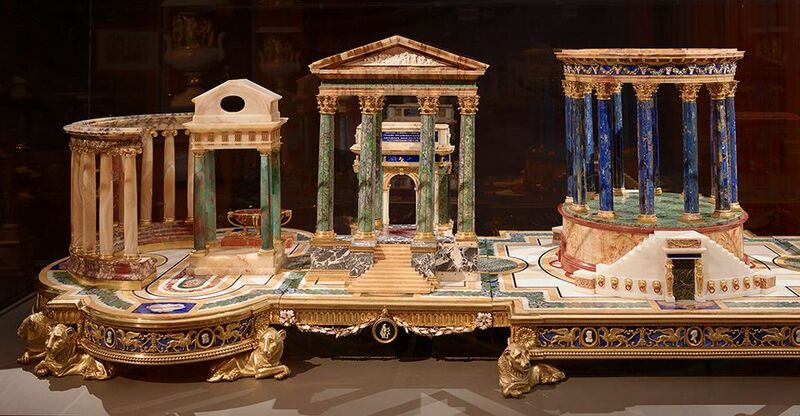 This banquet centrepiece (around 1778) has various architectural elements that can be moved around. Valadier’s incorporating of antique elements like cameos in many objects is particularly interesting. Other objects include furniture, oil lamps, serving ware, preparatory designs and statues, like those of saints he made for the altarpiece of Santa Maria la Nuova in Monreale, a treat to see up close. For the art historically-inclined, the show also provides an interesting look at the shift during the 18th century to the Neoclassical. Warm your heart in this chilly weather at the Museum of the City of New York, where the delightful exhibition A City for Corduroy: Don Freeman’s New York (until 23 June 2019) celebrates the 50th anniversary of Freeman’s story of the beloved bear, and presents other New York moments in the artist’s work. Learn about the layered process Freeman used for the illustrations in Corduroy (1968) and A Pocket for Corduroy (1978), or his interest in the theatre—for instance, he made the poster and Playbill art for the original Broadway production of A Streetcar Named Desire in 1947, and backstage drawings, like a charcoal work of Carol Channing applying her lipstick for Gentleman Prefer Blondes. Freeman’s images of everyday New Yorkers—a little girl playing on a fire escape, subway riders—are engaging and sympathetic. “He captured the energy and chaos of the city as well as its still, isolated moments,” says the museum’s director and president, Whitney Donhauser. The clever exhibition design by Marissa Martonyi (demonstrated by her toddler’s enthusiasm at the opening) includes a reading area that resembling a stage.